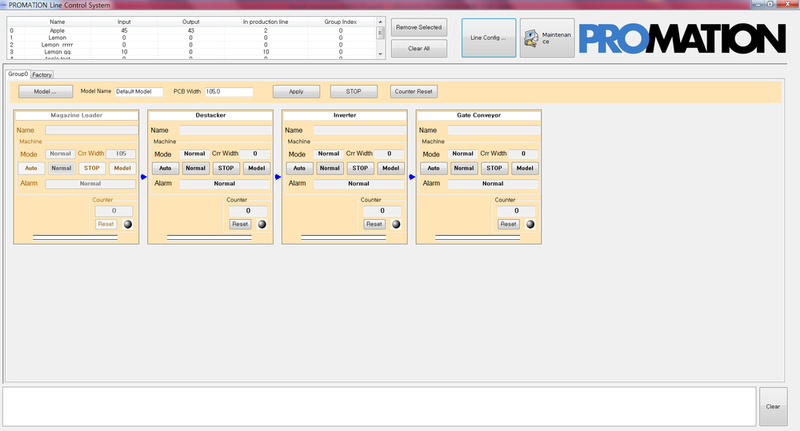 PROMATION’s “PRO 4.0” line control platform offers an Easy to Use PC based interface that links all handling systems to a single point for production runs. Designed for low to mid volume production runs with moderate to high daily change-over, the operator can select: All Line Change, Cascading Line Change, or Intelligent Routing which are all standard functions of the PRO 4.0 platform. After the production line sequence is established, each handler’s functions are input into the system Example (Buffer can be set to LIFO, FIFO, PASS , Select pitch, Hold & Cool timer before AOI, etc.) For Intelligent Routing, select the path to properly route production to select areas of the line. Select the JOB, enter the number of PCBs to be run and the system monitors the flow of production until that production count has been met. In Cascade mode, handlers look back to the PC for the next JOB and automatically changes to those new parameters and production count. If positioned before a non-linked system (i.e. Screen Printer) the handler asks the operator to validate that the screen has been changed before enabling SMEMA. XLM & MES file formats are standard protocols, and Bar Code readers are available, with complete networking as an option. System log files created and stored within the PC may be used for data output to a main network interface for data collection. Scaled to meet every budget, a PLC based RS485 version and Micom high speed data solution are both offered.